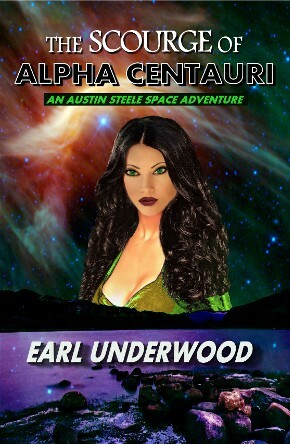 The Scourge of Alpha Centauri is available for purchase in softcover on Amazon.com. It's also available for Kindle e-book on Amazon.com. WHEN AUSTIN STEELE WAS MADE A CITIZEN ON XOVA, in the city of Tribalon, he is prepared to live a normal life, even after graduating from the Imperial Academy and becoming a special agent. But the discovery of alien ships approaching the planet prompts Commander Marna to request the assistance of Steele, Nik, Suze and Ser’F. They are assigned to Commander Marna to carry out a special mission. They are to take a ship to the region where the alien ships were discovered and determine if they can, whether the aliens are peaceful or hostile. They are taken aboard a massive ship called the Kram’ar II, and introduced to a race of people from the planet Kram’ar, many light years away. President Kei’th O’rnal and his beautiful daughter Sh’oora make quite an impression on Austin and his group. They are a peaceful people searching for a new home after their home planet was destroyed by a rogue asteroid the size of a small moon. They are seeking refuge and asylum after more than dozen years cruising though deep space. As negotiations progress a new threat emerges. Another race, far from peaceful, enters the region, ultimately engaging in a short battle. The aliens retreat but later return, declaring war on Xova. Austin’s adventure takes us to the far reaches of Alpha Centauri in his quest to help defeat the invaders. The story doesn’t end there as events become complicated by kidnappings and rescue attempts. Austin eventually ends up on the planet Varlboowui, ruled by Orsa Bol under absolute dictatorship. Kiak, Bol’s son and leader of the military, is determined to conquer Xova. He soon becomes aware of the massive ship from Kram’ar, but he is not sure whether they are allies with Xova or not. The climax is sure to get your adrenalin flowing as unexpected surprises just keep on appearing.